87% of our research is world leading or internationally excellent (according to REF 2014) so your studies will be informed by some of the most exciting and innovative ideas across all fields. Our vibrant campus, and location right on the edge of the city of Bath, provide superb sporting, social and cultural opportunities. We are one of the safest campus sites in the UK - we were one of the first universities in the country to win a national police approved security award. Also named Sports University of the Year 2018 The Times & The Sunday Times Good University Guide. We were ranked 12th in the THE research quality ranking of UK universities (non-specialised). The research we carry out makes a difference to society - from developing new drugs to cure breast cancer, working with Ford to develop fuel-efficient engines, to the Queen's Anniversary Prizewinning research into child poverty. Excellent teaching and research facilities, including purpose built laboratories. Supported for your research from internationally recognised supervisors. Opportunities to enhance your employability via targeted skills training or, for selected programmes, work placements. Bath is a cosmopolitan city with a rich cultural heritage and is only one of three cities in the world to be included on UNESCO's World Heritage list. 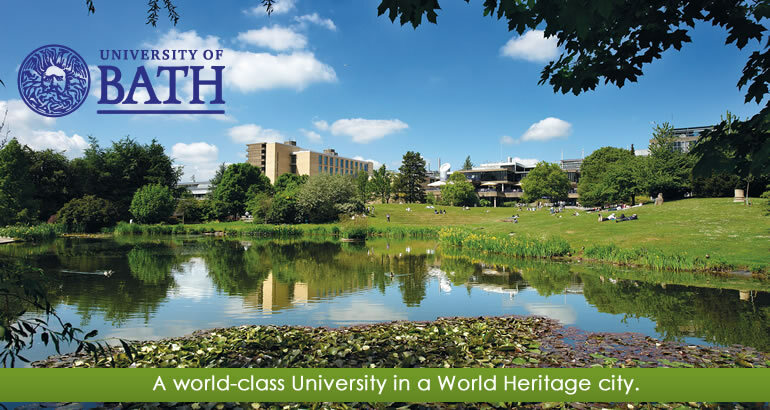 The Department for Health was established within the University of Bath in 2003, to centralise the high profile research and teaching in the health-related disciplines already taking place throughout the university, so creating a single entity through which links with the health sector at national and international level can be channelled, co-ordinated and developed. In 2010 the School joined the Faculty of Humanities & Social Sciences and became the Department for Health, providing excellent opportunities for academic teaching and research collaborations with other departments, such as Psychology and Social & Policy Sciences. The Department's postgraduate teaching and research programmes now form part of the Faculty's new Graduate School, also launched in 2010, providing postgraduate students with dedicated support and a strong community in which to base their studies - whether on campus or by distance learning. To identify and facilitate opportunities for academic collaboration and new developments. The Dept's postgraduate taught programmes combine academic excellence with flexible and innovative design and delivery; our postgraduate portfolio is distinguished by the provision of a number of Professional Masters and a Professional Doctorate programme designed to be studied part-time by learners working in a wide range of healthcare roles from all around the world. All our postgraduate courses are taught online and this has proved to be one of our unique selling points, with students able to continue within their practice area or working environment whilst gaining a further qualification. The Dept is renowned for its exemplary attention to educational design, integrating knowledge with research evidence and resulting in programmes which are highly relevant to contemporary practice; in addition, the Dept boasts some of the most innovative and successful approaches to online and part-time education, recognised through a number of awards. At all levels, learning and teaching in the Dept provides a strong focus on high quality education for real world situations and produces graduates with skills and knowledge relevant to professional roles and in high demand from employers. The innovative Professional Doctorate in Health which focuses on both Population Health and Healthcare within the Dept, providing a doctoral level programme to develop expert practitioners and researchers in practice. Sport and exercise science and medical science laboratories. Close links with the English Institute of Sport and the Department of Sports Development and Recreation. There are current links with primary care trusts, strategic health authorities, the two hospitals in Bath and colleagues in industry. The Dept works closely with esteemed international academic institutions, and individual health practitioners, in order to meet the regional, national and global challenges facing health and social care. Postgraduate research students gain a wealth of experience to assist them with their next step and are offered personal career advice at the University. The Dept has an established research training skills programme for all research students. The taught programmes enable students to extend their health and social care career pathways and to build important networks for further professional opportunities. The Department of Education is a thriving academic community with a strong national and international reputation for research. In the most recent Research Assessment Exercise (2000), we once again maintained our Grade 5 status in recognition of the quality of the research carried out by our staff. Postgraduate taught provision ranges from teacher training programmes at both Honours and Masters levels to high quality Masters courses, aimed at qualified and experienced teachers, lecturers, trainers, educational managers and administrators who wish to engage in advanced study in education; we offer specialisms as diverse as educational leadership and management, environmental education, international education, sports coaching. Alternatives include the MA in TESOL (Teaching English to Speakers of Other Languages) and new for 2008, an MA in Coach Education and Sports Development. If you are interested in developing your research methodologies and refining your ideas before embarking on either an MPhil/PhD or a Professional Doctorate (EdD) with us, we offer a Master of research (MRes) programme as a stepping stone. The Department prides itself upon the quality of its teaching and provision for students and this was officially recognised by the Quality Assurance Agency for Higher Education (QAA) which in a recent external inspection awarded the Department an 'excellent' score of 23/24. We host approximately 40 academic and research staff and over 100 students on doctoral programmes (MRes, MPhil, PhD, EdD) studying full-time and part-time both here on campus and throughout the world.